Recording Artist T. J. Doyle, [http://www.tjdoylemusic.net __title__ ], whose debut album “One True Thing” was released in late 2009 by Indie Label Totem Artists, Inc., is in the process of recording his 2nd album and is releasing April 15th the first single “Everything”, produced by CJ Abraham and mixed by Ryan Greene, and Music Video, produced by Filmmaker, Frank Lucatuorto. The “Everything” music video plays like a mini movie with home movie like clips arranged to emphasize the lyrics of the song as crafted by Lucatuorto. The video was previewed on YouTube 4 weeks ago http://youtu.be/xH1ScZhcI6Y and has picked up 24,000 views before the actual release and availability of the single on iTunes. Early fan responses to the music video have been overwhelmingly positive. 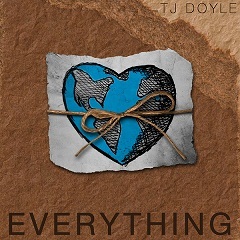 With his critically acclaimed debut album “One True Thing”, TJ Doyle won over fans worldwide. With the success of this project the industry took notice of TJ's well seasoned musicality and unique ability to communicate a message within his lyrics. Currently he is in the studio with multi platinum producers CJ Abraham, Chris Rojas (Pink, Big Time Rush), and Ryan Greene (Desmond Child, Glen Ballard, Diana Warren, Megadeth, Lita Ford, Cheap Trick, Nofx, Bad Religion, Strung Out, Lagwagon, No Use for a Name, Patty LaBelle, Jay-Z, Tonic), and working on his sophomore album. This album incorporates similar themes of love and green activism but this time TJ has a team producing the project and allowing him to step into the recording booth and do what he does best. All ten songs are written by TJ Doyle and lyricist Lynda Levy and the first single, “Everything” is mixed by Award Winning Mix Engineer Ryan Greene and released April 15, 2012. TJ will be releasing a series of singles leading up to the release of the full album in 2012. Doyle is making his 2nd album over the summer of 2012 and inviting fans to take the journey with him through a series of videos that will be uploaded regularly to his YouTube channel [http://www.youtube.com/tjdoylemusic __title__ T. J. Doyle Music Channel]. The videos will share stories, previews of songs performed by Doyle on acoustic guitar, a view of the pre-production done with other musicians, and then finally the commercial recording of Doyle’s 2nd album. T. J. Doyle and his band members, Les King on Bass (Tom Jones, Tom Scott, Bony James, Steve Cole, Billy Childs, Everett Harp, Kerry Griffen on Drums (Maxwell), and Phil Parlapiano on Guitar, Accordion, and Keyboards (John Prine, Tracy Chapman, Lowen & Navarro), will perform at the Park La Brea Theater on Saturday April 21st for Park La Brea’s Earth Day Festival at 12 Noon. The Park La Brea Earth Day Festival and T. J. Doyle’s Show are free and open to the public. T. J Doyle can be reached at tj(at)totem-artists(dot)com.